Floral with a sweet and sour palate heading to a dry and spicy finish. Miyagikyo is located on the island of Honshu to the west of the city of Sendai, two hours by high-speed train to the northeast of Tokyo. Built in the foothills of the Miyagi prefecture, at the heart of a region famous for its waterfalls and many hot springs, the distillery is a true haven of peace. After three years of research, this site was chosen for its pure air and high humidity levels, ideal for ageing in barrels. The environment is similar to that of the Cairngorms region in the heart of Scotland. Only the cherry trees remind you that you are indeed thousands of miles from the Highlands. The contrast between this green leafy environment and the ultramodern distillery is striking. Here everything or practically everything is computer-operated. The malt is imported from Scotland or Australia. The barrels are stored in traditional cellars with just two floors, as the distillery is situated in the middle of an earthquake zone. 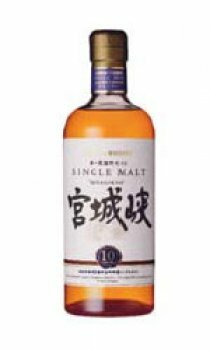 Miyagikyo, using large stills, produces a spirit that is rich and fruity with elegant aromas. In 1998, a grain distillery with two coffey type stills - four columns in total - was built on the same site as the malt distillery. One of the two stills dates from the 19th century. It is a real museum piece. This magnificent copper column produces traditional grain whisky from maize and not wheat, as is often the case now in Scotland.